"A Comparison of Pitt the younger and Sir Robert Peel." After having been tutored at home, William Pitt went up to Pembroke College (then Pembroke Hall) Cambridge at the age of 14, going on from there to Lincoln's Inn and practising as a barrister before entering politics. He remained greatly attached to Cambridge, and, having previously stood unsuccessfully, was finally elected as an MP for Cambridge University in 1783. He was Prime Minister 1783-1801 and 1804-6, dying in office at the age of 46. He had been a delicate child and youth and H. A. Bruce describes him as a "tall, ungainly, bony figure" (qtd. in Ehrman and Smith), which is certainly how he appears in Westmacott's likeness. 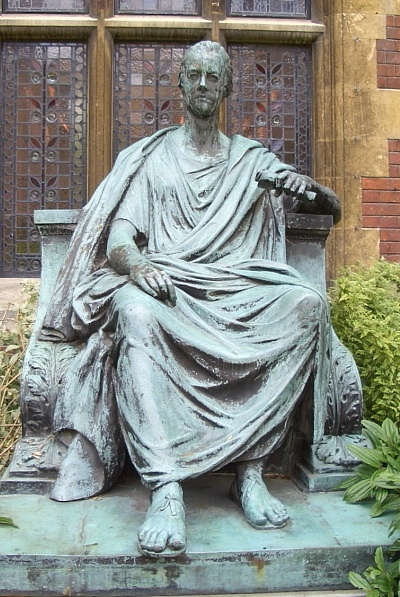 Still, according to Ehrman and Smith, he "was seen as a great agent and symbol of change" and was duly honoured by this statue at his old college. "A&A. Art and Architecture" (a Courtauld Institute of Art site). Viewed 29 June 2008. Ehrman, J. P. W., and Anthony Smith. "Pitt, William [known as Pitt the younger] (1759-1806)." Oxford Dictionary of National Biography. Viewed 29 June 2008.